When it came to choosing a godmother for Azamara Pursuit, we faced a tough decision. Naturally, we wanted someone very special who would bring good luck and protection to the newest member of our fleet. We also wanted a godmother who would represent two of our key markets, the United States and the United Kingdom. Most importantly, she should personify our dedication to Destination Immersion® experiences. And then we found her. Or perhaps we should say “them”. 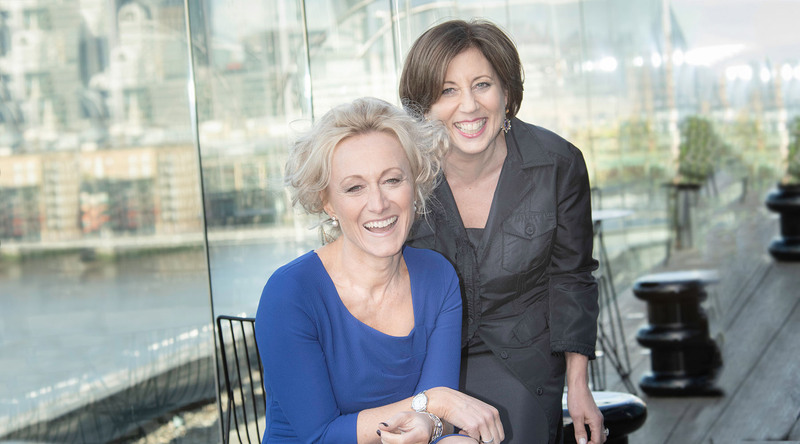 Azamara Club Cruises® is delighted to officially announce Azamara Pursuit’s two godmothers: Ellen Asmodeo-Giglio and Lucy Huxley. True travel experts, they are the perfect Azamara embodiment of immersive travel. In celebration of in-depth travel experiences, we are thrilled to have our two new godmothers christen the Azamara Pursuit on August 28 in Southampton, U.K.
Ellen truly believes that travel changes lives. You can see that in her love of authentic travel experiences and connections, as well as throughout her impressive career in the travel industry. With more than 20 years of publishing, marketing, and sales experience, Ellen is now the Chief Revenue Officer of AFAR Media—a multi-platform brand focused on experiential travel. The company also supports the AFAR Foundation, established to promote cross-cultural exchange, and, through its Learning AFAR program, sponsors international travel by high-school students who otherwise could not afford to experience another part of the world. Most recently, Ellen served as Vice President and General Manager of Weekend Edition & Luxury Group at The Wall Street Journal. Prior to that, she was a luxury marketing consultant and Senior Vice President and Publisher of Travel + Leisure. Says Ellen, “What I love so much about Azamara is the destination immersions. They were the first to really give their guests a deeper immersion into places, to have that better experience, and have a more meaningful takeaway. There are so many ports that Pursuit is going to that I want to go to. This would be an amazing way to see Iceland. Over the years, Lucy would joke saying, “Someone’s going to make me a godmother one day.” We are very happy we did, because with her industry experience and love of immersive travel, she’s going to be a great godmother for Azamara Pursuit! Lucy began reporting on the travel industry in 1998, and now serves as an Editor-in-chief at Travel Weekly Group Limited. She spearheads editorial content across the group’s portfolio, including Travel Weekly, Travel Weekly Business, Travolution, Aspire, and gazetteers.com. She joined in 2010, following 12 years at Travel Trade Gazette, the last three as editor. A big fan of cruising (“I just think cruising is a brilliant, brilliant holiday”), Lucy is very much looking forward to taking an immersive voyage in South America. and unforgettable, unique experiences with Azamara Pursuit.